What if the slip matches the clay? of what you’ve done if the slip matches the clay? by fellow-potter-friend Amy Higgason may have resolved my problem. Why not simply color the slip so it contrasts more? Sounds simple, right? Why did I never think of that? 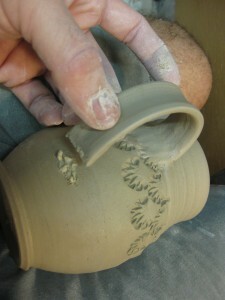 the “real firing” starts to affect the pots. 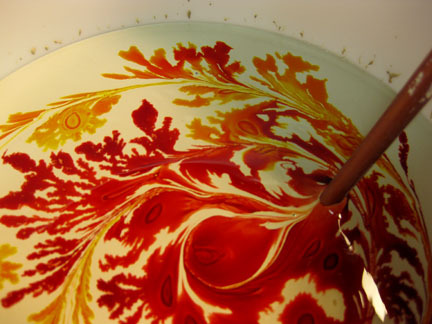 it seeped & spread, made really fun patterns that evolved as I stirred it together!!! So tonight I put some “finishing touches” on the mugs! soda atmosphere and create dramatic colors and random flashing marks. 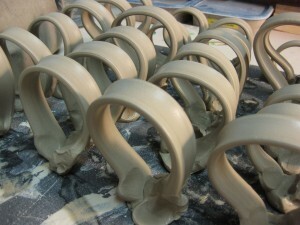 and applying handles. It’s usually the last step before I let the pieces air-dry. each and every little stamp, one by one… each one with a touch of slip! Mugs, Mugs & More Mugs! 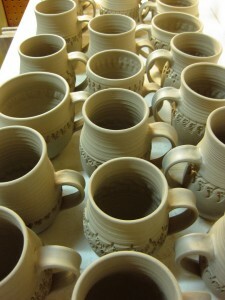 One of my favorite things to make… mugs! 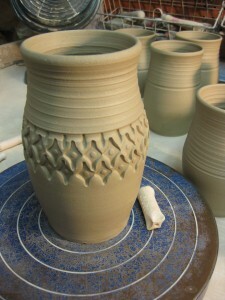 Many potters despise the process; mostly because of their fear of handles. for those feeling under the weather… or in my case… ice cold grape pop!!! 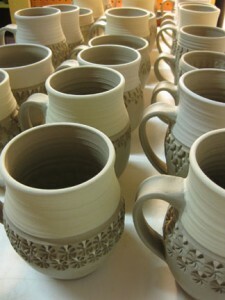 So I’ve spent the past few days working in the studio on a new batch of mugs. in “batches” instead of singles. I like the production aspect of it all. Creating a quantity of something… then moving on to the next. When they are a fairly damp “leather-hard” I begin the stamping decoration. when you get back to where you started!!! the bottom to create a finished looking foot ring. 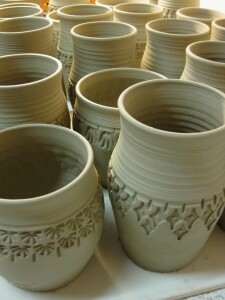 After trimming, the handles are pulled and allowed to stiffen up. to the side of the cylinders to create a “not-quite-so-instant” mug! then scratch & slip both the ends of the strap and the attachment points. it creates a strong bond when attaching clay to clay. 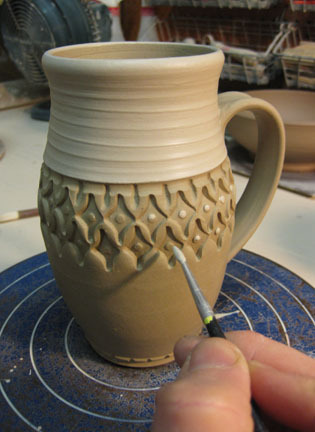 to help the moisture level of the mug and handle equalize a bit before full drying. temperature of 2350-degrees. 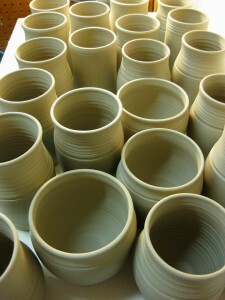 The kiln will cool for a full day, and be unloaded the next. All of that for a simple mug. but I finally took the “technology plunge” last night! 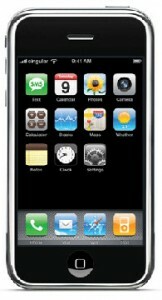 my cell phone is one of the oldest out there! so why not treat myself to a new toy?! I’ve had it less than 24 hours and I’m already addicted! Plus Internet access anywhere, anytime with the touch of a finger! I’ve downloaded a few fun “aps”… or “applications” for the unaware. an awkward session of determining who owes what?! No more. movie theater is to wherever you are at that time – plus the shows & showtimes! Oh, but wait there’s more… it also shows you the movie’s preview trailer!!! And that’s just the beginning of the iPhone fun… I’m hooked. A quick thank you to my loyal art fair friends! But it is also time to start thinking about the summer art fair season! and I’m starting to plan my summer season. “Top 10 Selling Artists” at last summer’s fair. Yeah!!! Mark your calendars… more details to come!